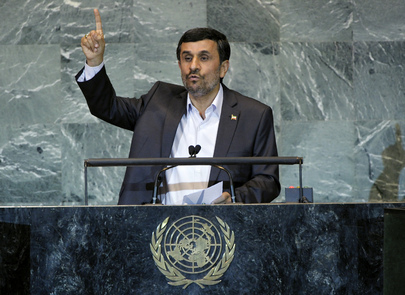 MAHMOUD AHMADINEJAD, President of Iran, stressed that most nations were unhappy with the current international circumstances, and that — despite general aspirations to promote peace, progress and fraternity — wars, mass murder widespread poverty and socio-economic and political crises continued to infringe upon the rights and sovereignty of nations. Approximately 3 billion people lived on less than $2.5 per day, and 40 per cent of the poorest in the world shared only 5 per cent of its income. The root cause of the world’s current problems must be sought in the prevailing international order and the way the world was governed, he said, asking a series of questions about the “arrogant slave masters and colonial Powers” that dominated global decision-making. Among those, he asked who had imposed colonialism around the globe, and who had imposed terror and mass murder on Palestinian people and on countries in the Middle East region. By using their imperialistic media network, they threatened anyone who questioned the Holocaust and the 11 September event with sanctions and military action, he said. Last year, when the need to form a fact-finding team to undertake an investigation concerning the “hidden elements” involved in the 11 September incident had been raised, Iran had come under pressure and threat by the United States’ Government. Instead of assigning a fact-finding team, they had killed the main perpetrator and thrown his body into the sea. It would have been reasonable, he stressed, to bring that perpetrator to trial. Meanwhile, the United States viewed Zionism as a sacred notion and ideology, condemning any question about it as an “unforgivable sin”, while endorsing and allowing sacrilege and insult against the beliefs of other religions. Real freedom, justice, dignity, well-being and lasting security were the rights of all nations, he continued. However, those values could be achieved neither by reliance on the current inefficient system of world governance, nor through the invasion of the world by arrogant powers and the gun barrels of North Atlantic Treaty Organization (NATO) forces. Instead, they must be realized through independence and recognition of others’ rights, and through harmony and cooperation. All those who had tried to introduce reforms while preserving the existing norms and tendencies had failed. The valuable efforts of the non-aligned movement and its Group of 15, and the Group of 77 developing countries and China had failed to bring about fundamental changes. Efforts, therefore, must be made with a firm resolve and through collective cooperation to map out a new plan. There was no other way than the shared and collective management of the world, he said. Member States should not allow the United Nations, which was a reflection of the collective will and shared inspiration of the community of nations, to deviate from its main course and “play into the hands of world Powers”. That Organization had been created to make possible the effective participation of all nations in international decision-making process. However, the current composition of the Security Council was unjust and inequitable. Changes, including the restructuring of the United Nations, were the basic demands of nations, and must be addressed by the General Assembly. He reiterated a proposal, made during the last session, to designate the current decade as a “decade of shared and collective global management”. The world was witnessing, in Islamic lands, in Asia, Europe and the Americas, movements that were expanding the pursuit of the realization of justice, freedom, and the creation of a better tomorrow. “Today, nations have been awakened,” he concluded, asking States to salute the bright future that awaited humankind. Speaking in exercise of the right of reply, the representative of Iran, responding to the statement by the Minister of the United Arab Emirates, said the three Iranian islands in the Persian Gulf that the latter had referred to were an eternal part of Iranian territory and under Iran’s sovereignty. He stressed Iran’s determination to continue its friendly relations with the United Arab Emirates and reiterated that all of Iran’s actions on the Iranian island of Abu Musa had been in exercise of Iran’s sovereign rights in accordance with documents signed in 1971. “We’re ready to continue talks with the United Arab Emirates to remove any misunderstanding in that regard,” he said. He added that the only correct name of the sea between Iran and the Arabian peninsula was the Persian Gulf. He dismissed the use of any other names as illegitimate and void.